Can you see it?! No? Look really close. It's hiding, but it's there. 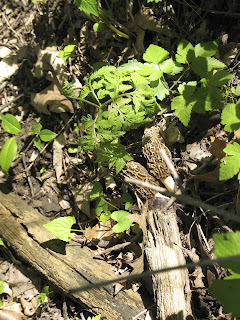 There are a lot of things that I couldn't do in Los Angeles and morel hunting is one of them. Oh, how I missed it. 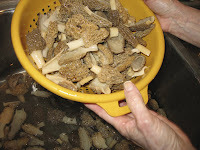 If you don't know what a morel is then check out a few of these morel sites. Although the taste is fabulous, the actual hunt...and find... is what makes this mushroom such a treasure for me. Since we moved back, I've been trying to schedule a morel hunting trip with my parents. The window of opportunity is very small and is extremely dependent on the weather. Last year, that little window was open while we were out of town. But this year was perfect and the girls are old enough to be able to do the trek with us. We headed out to a wooded area in Muscatine County praying that nobody else beat us to it. At first, the girls were skeptical. After that 30 seconds passed, we were good to go and Miss M could frequently be heard telling the rest of us to hurry up. She's a natural-born hiker. Once we found our first patch, we were all filled with excitement. My mom called the girls over to start looking and picking. Then I arrived on scene and found even more. DH trailed behind me and found ones that I had missed. Those sneaky little things hide when they see you coming. Miss K did a great job because she was lowest to the ground. 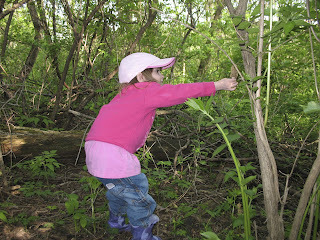 She was actually finding them on her own without us hinting at an area to look. Miss M was doing just as well. We ended up with about two and a half pounds of morels for this outing. We enjoyed several for dinner then froze the rest. I'm sure the girls will be just as excited for next year's hunt as I usually am! De lurking to tell you that my mouth is watering. 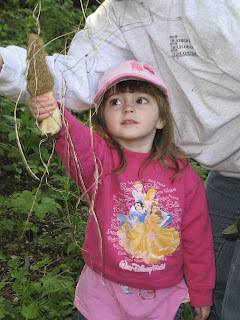 I grew up in Iowa and miss mushroom hunting (ok...frying) SO MUCH!!! Love your blog. My question has got nothing to do with today's blog. Just wanted to know if you have managed to restore the link for the Blog Hunt. I know the hunt is finished but I would like to follow till the end. Not a blogger myself but love to read other people's & all the great advice given sometimes. Vanessa - Sorry, but she emailed me back and said that mine was not the only broken one. Unfortunately, mine was just the first broken one. Several other people also removed their links. Since I don't have the code to restore it, I can't rejoin. On the brighter side, she's probably planning another one though because the first was a huge success. I fixed your link to my website. Everything on my blog went kinda wacko about a month ago and effed with my linkage. When you get a chance, check it. I am too nervous to go mushroom hunting--I am just positive I would find a 'deadly' one lol! the hunt looks like so much fun! Like an Easter egg hunt! I don't like fungi so I wouldn't eat them, but finding them would be great! That looks like so much fun. 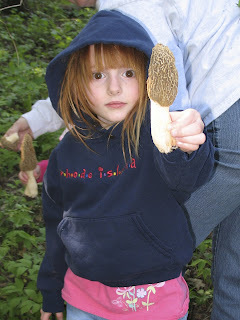 When I was little I ate a mushroom from the backyard and my mom had to give me stuff to make me puke it up. I love shrooms! I'm not a big mushroom fan but reading your article made want to go out and find the little buggers. Can you buy this type of mushroom in the regular markets? Haven't I already made this same comment? Your family goes on the most fun outtings ever! I used to do this as a kid with my grandma. We would go camping and then early in the morning go mushrooming. We would come back with huge amounts of mushrooms that she would fry up for breakfast along with some eggs. It was MAGICAL. Thanks for the memories and what a fun thing to do with your kids! Off to the Restaurant Bathroom. Again. If I Build It, You Will Come?